Spherical trigonometry has all the qualities we expect of the best mathematics: it is beautiful, useful and fun. It played an enormously important role in science for thousands of years. It was crucial for astronomy, and essential for global navigation. Yet, it has fallen out of fashion, and is almost completely ignored in modern education. A beautiful popular book, Heavenly Mathematics, has appeared recently (Van Brummelen, 2012). It traces the historical development of spherical trigonometry and describes its role in scientific progress, from ancient Greece, through India, the Islamic Enlightenment and the Renaissance, to more modern times. We have written on this blog about Napier’s Nifty Rules. These rules give ten relationships between the angles and sides of right-angled triangles on the sphere. (Recall that the sides of the triangle are expressed in terms of the angles they subtend at the centre; the radius of the sphere is taken to be unity). This beautifully simple equation may not appear familiar but, believe it or not, this is just the spherical form of Pythagoras’ Theorem! cos a ≈ (1 – ½a2 ) , cos b ≈ (1 – ½b2 ) , cos c ≈ (1 – ½c2 ) . the usual form of Pythagoras’ Theorem that we all know and love. is equal to the sum of the squares of the two adjacent sides. cos c = cos a cos b + sin a sin b cos C .
Note that this is the Pythagorean relationship with an “extra bit”. This is just the relationship that we need to calculate the distance between two places on Earth. Knowing the latitudes and longitudes, (λ1,φ1) and (λ2,φ2), we construct the spherical triangle comprised of two meridians from the pole to the points, and the great circle joining the points. Then we know a=½π −φ1, b=½π −φ2 and C= λ2−λ1 and we can immediately get c.
This is just the Cosine Law of plane trigonometry; again, it is the Pythagorean relationship with an “extra bit”. 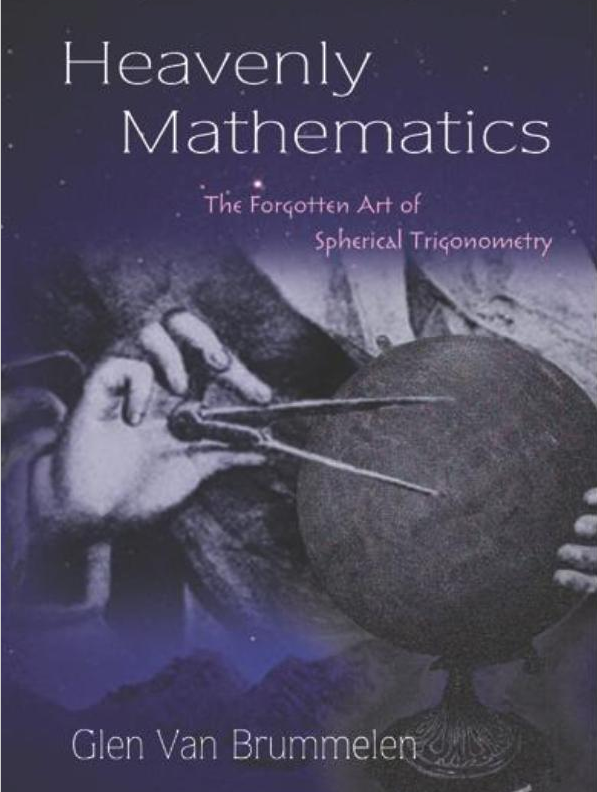 Glen Van Brummelen, 2012: Heavenly Mathematics: The Forgotten Art of Spherical Trigonometry. Princeton Press.